A Year of Being Here: D. H. Lawrence: "Maximus"
with his cloak over his arm, waiting to be asked in. He came in slowly, and sat down by the hearth. entered me, I smiled to myself, saying: He is a God! and still, this is the God Hermes, sitting by my hearth. 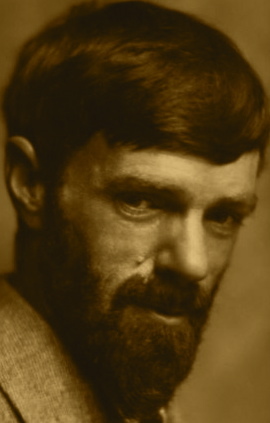 "Maximus" by D. H. Lawrence, from The Complete Poems of D. H. Lawrence. © Wordsworth Editions, 1994. 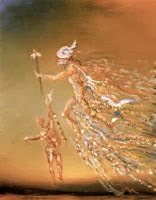 Image credit: "Hermes," oil on canvas, by Salvador Dali, 1981 (originally color).